Are you familiar with Chicken + Dumplings? Growing up in Boston, I had never heard of this comfort-food meal until I moved down to Tennessee. I adore soups/stews + I’m a sucker for comfort food, so it’s no surprise that when I finally tried it, I loved it. Until this past weekend, though, I hadn’t considered making it from scratch. It’s served at lots of local restaurants, so if I crave it, there are plenty of places to grab a quick bowl. However, when I got my latest issue of Real Simple + saw a recipe for Classic Chicken + Dumplings + took it as a sign that it was time to try making it myself. Well, I did, and it turned out SO delicious! Even my husband, not normally a huge soup fan, raved about how amazing it was. He’s a born-and-raised southerner, too, so he knows his Chicken ‘N Dumplings! =) It’s fairly easy to make, although a bit time-consuming due to a bunch of different steps. Trust me, though – it’s worth it. You wind up with a rich, creamy, super-delicious chicken broth loaded with juicy chicken, lots of savory veggies, + scrumptious, herb-filled dumplings. I’m seriously craving it again as I write about it … and I just had a bowl a few hours ago for lunch! I made this on the first day of fall, + after we both loved it so much, my husband suggested that we make it a yearly tradition – to always make homemade Chicken + Dumplings on the first day of fall. How fun is that? It is so good that I’ll definitely be making it lots of times between now and the first-day-of-fall-2014 – any time I’m craving a delicious, made-with-love, perfect comfort food meal. Heat the oil in a large pot or Dutch oven over medium-high heat. Season the chicken with ½ teaspoon each salt + pepper. Brown in batches, 4 to 6 minutes per side. Transfer to a plate; reserve the pot. Add the celery, carrots, onions, thyme, + garlic to the drippings in the pot + cook, stirring, until the vegetables begin to soften, 5 to 7 minutes. Add the chicken, bay leaves, + 10 cups water. Bring to a simmer + cook until the chicken is cooked through, 30-45 minutes for chicken breasts, or 25 to 30 minutes for thighs. Discard the bay leaves + transfer the chicken to a plate; let cool. Shred the chicken with 2 forks + return it to the pot (discarding the skin and bones). Whisk together 1/2 cup of the flour, 2 cups of the cooking liquid, + 1/4 teaspoon each salt + pepper in a small bowl. Slowly whisk the flour mixture back into the pot + simmer until slightly thickened, 8 to 10 minutes. Taste the soup and add more salt/pepper if needed. Make the dumplings: Whisk together the remaining 2 cups of flour, the baking powder, baking soda, 1/2 teaspoon salt + 1/4 teaspoon pepper in a medium bowl. Whisk in the butter, buttermilk, + parsley. Reduce heat to low and drop the mixture into the broth in 12 spoonfuls. Simmer, covered, until the dumplings are firm, 12 to 15 minutes. Serve hot sprinkled with additional parsley, if desired. Amy, that is one big pot of deliciousness. This is so going on the menu this weekend. Yum! Yay! So glad it turned out. I can’t believe Bostonians don’t have chicken & dumplings! That is such a great idea to make it an annual Fall tradition. Looks so yummy! I love that The Husband suggested a tradition of making a seasonal meal on the first day of fall. I’d love to steal that + extend it to celebrate the first day of every season. How fun! Those chicken + dumplings look so very delicious, too. I love comfort food – this is definitely a great way to welcome the best season of the year. I love chicken and dumplings. Or chicken and “noodles,” which is similar, but a family recipe that requires noodles made from scratch. So so good. I love this as leftovers after all of the flavors have sat a while and the broth gets a bit more thick. Yes! I’ve been eating the leftovers for the last couple days and they are SO good! I love chicken and dumplings, great comfort food! I adore chicken and dumplings! My husband is not a big soup person either but when it comes to comfort food, he’s all over it! This looks amazing Amy. Pinning! This comfort food looks made for everyone! I love that, Adri! I used my Le Creuset for this dish, and for most of my super-homey comfort food soups + stews, too. When it’s on the stovetop or in the oven, you know something good will be for dinner that night!! Oh yum – what a lovely and delicious bowl of comfort food this is! I’m definitely making this the fall/winter. It looks awesome. It’s wonderful to have a new tradition, too! 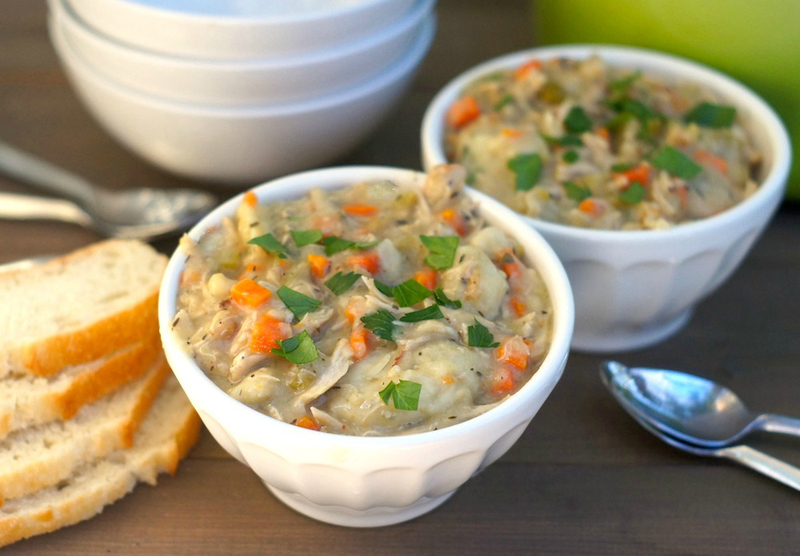 Chicken and dumplings is such a perfect fall dish! Yours looks amazing! i’ve recently pulled out a few different chicken & dumpling recipes…this sounds fab! That is one big pot of delicious fall comfort food! I’ve never had chicken and dumplings, but now I’m dying to try it!! What a great new tradition! It’s funny – I live in Canada, and one of my favorite dishes as a kid was chicken and dumplings. How did this dish skip Boston and make it up to us? 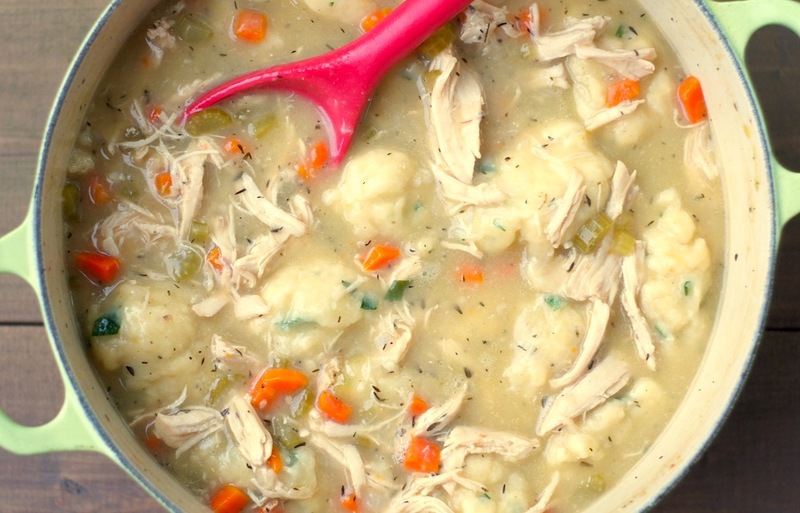 Your Chicken and Dumplings is definitely comforting in this cooler weather. So gorgeous too. Thank you so much for sharing. I think Chicken and Dumplings looks delicious, and I love the seasonal change tradition. I have a friend whose family celebrates solstices with a feast of black and white foods, so why not do the equinox up too? How cool that you celebrated with dumplings, too! I love the idea of adding them to beef stew – YUM! Yum, yum, yum! LOVE chicken and dumplings. On my to-do list is a chicken and dumplings recipe for the crock pot. I will let you know how it goes! I love my crock-pot, so do report back how the slow-cooker version goes if/when you try it! Amy, this is a dish I’ve been meaning to make for a long time. I’ve never done it either, and I love how your bowls look. Comforting yet bright and fresh. What an awesome new Fall tradition – I’d say this chicken and dumplings is the perfect way to celebrate the season! Looks so good, Amy! Oooh, my mom used to make this amazing comfort food all winter, thanks for reminding me about it! I need to make this. This dish was outstanding! TOOK TWO HOURS TO MAKE, BUT IT WAS WORTH EVERY SECOND! That is fantastic to hear, Marie! Agreed, it’s a bit time-consuming but totally worth it. So happy you enjoyed it! AMY: THANK YOU FOR THIS RECIPE!!! I saw it on http://www.foodgawker.coma few days ago and was drooling over the photo. A perfect fall dish. FINALLY HAD TIME to make this dish for dinner last night. My family loved it! It took a while to make, but was WELL WORTH the effort. Next time I will double the amount of chicken thighs and add garlic to the dumplings. But don’t get me wrong, it was AMAZING already. My husband loved it and he had seconds..he does not normally get excited about food, but he was still talking about how good last night’s meal was this morning. He asked if we could have leftovers for dinner tonight! Mary, that is so awesome!! I love your idea of adding garlic to the dumplings next time – I bet that would make them even more delicious! And adding more chicken is only a good thing. =) And in terms of the cookies, you could try this recipe, and just substitute peanut butter chips for the butterscotch tips, plus add a bit of peanut butter to the dough? Just an idea! This looks fantastic and is a welcome variation from the chicken and biscuits I serve regularly. I will be trying this dish, thank you for sharing!! I am from Tennessee and this is a staple for us all year around. We always cream of chicken and mushroom soup both which I do not have since I am living abroad right now so I found this recipe. I plan to make this tonight so thanks it looks great. I made this last night at it was AH-mazing! Thanks for the wonderful recipe. Kids and grown-ups devoured it. I’m from Canada on beautiful Georgian Bay in Central Ontario. We’ve grown up with this meal, and have it often during winter months. Comfort food. And although it’s sometimes called Chicken and Sliders in our area it’s still a great meal. Sliders are made with flour, water, etc and rolled out and cut into strips and dropped into the broth and then cooked like dumplings. It’s a bilingual community here and I think that’s where the slider name comes in, from the French. I tried this recipe and loved it. I will make this recipe over and over again! Yummly! Hi Jane! Some of my friends here in Tennessee do the dumplings the same way you mention – rolled out and cut into strips. I think I’m going to try that next time, just to mix it up a little bit. =) This is one of our favorite comfort food meals, too! 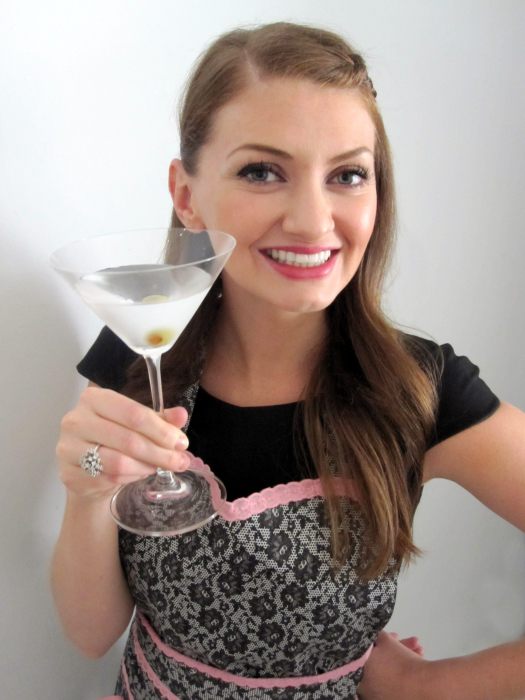 I’m so thrilled that you tried the recipe and loved it. Thanks for stopping by!